Dr. David Leffler, Gerald Geer, and Col. (Retd) S. P. Bakshi published an article about how the Transcendental Meditation program is helping bring a new peak level of performance to individual military personnel and their units by improving physical, psychological and team productivity. This article appeared in the May special issue of Defence and Security Alert, Vol. 4, Issue No. 8, page 34-39. 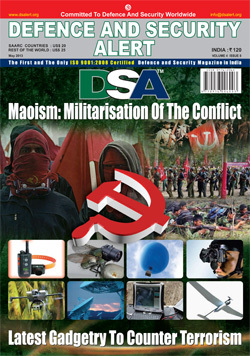 For more information about this publication visit: http://www.dsalert.org. Stress is a very major degrade factor on combat performance. Troops of the Army, CPOs and Police deployed in CI / CT operations must cope with high levels of stress. The article presents a solution in terms of TM. The TM technique is the most thoroughly researched and successful meditation practice in the world. Over 350 research studies published in leading, peer-reviewed scientific and medical journals have confirmed that TM practice produces wide-ranging, measurable benefits, including increased intelligence, creativity and mental clarity; reduced stress and improved health; and more fulfilling and harmonious interpersonal relationships. These studies have been conducted at more than 200 independent universities and research institutions in 30 countries. This stress-busting approach has been taught worldwide for the past 44 years and today over 6 million people in 180 countries have learned the practice. This entry was posted on Thursday, June 13th, 2013 at 10:44 am	and is filed under Articles. Both comments and pings are currently closed.